Even in the midst of this cool, snowy March, it’s beginning to feel like Spring here at Tinicum CSA. The greenhouse is filling up with newly seeded flats of lettuce, kale, cabbage, and many other spring veggies. 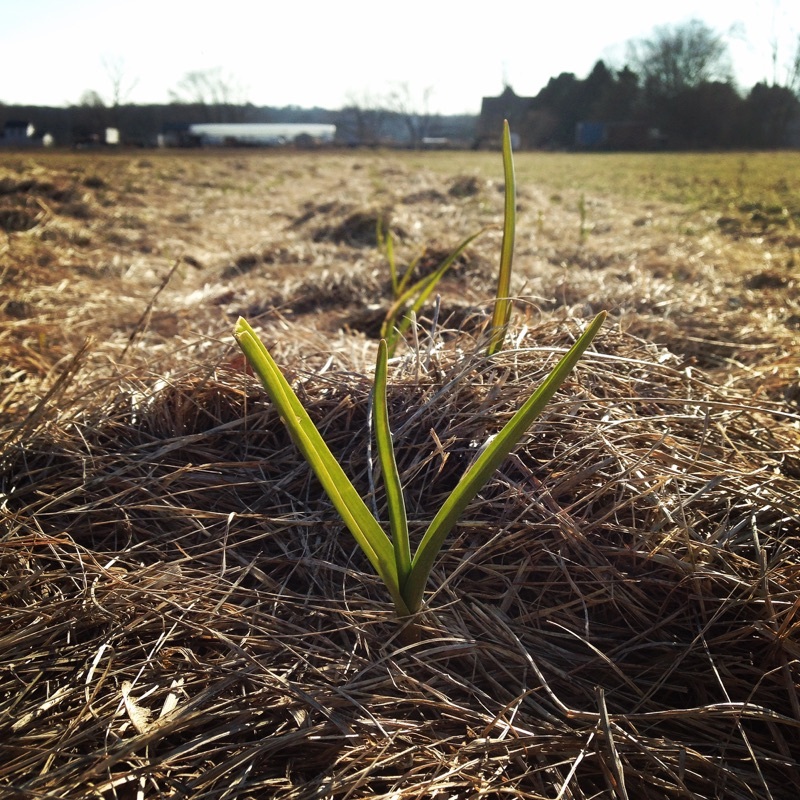 The garlic, planted in October, is looking eager to grow. And the farm is awakening with daily work by your farmers. The 2018 work season officially began on Monday, March 5th. Our new Farm Assistant, Robert Vargas, started working with me on the spring tractor tune-ups. 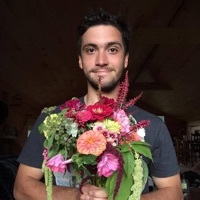 Rob is from Northeastern PA and is interested in a vegetable farming career. 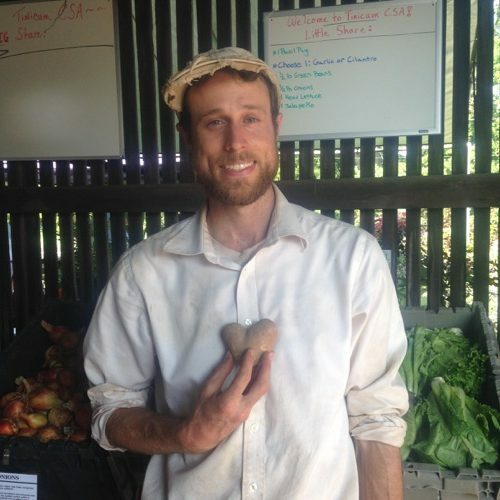 Having spent an entire season on another veggie farm in Washington State, Rob is excited to continue learning and farming here at Tinicum CSA. He is particularly excited about this year’s flower patch. In April and May two part-timers, Carolyn & Nate, will be joining the farm crew to help out with planting, weeding, and harvesting. In addition to annual tractor maintenance, we’ve worked on setting up the new Office Shed, featured here. 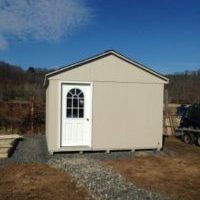 The folks at Stoltzfus Structures, near Lancaster, kindly built and delivered it in February. Our shed houses the vegetable seed and provides an important organizational space for the farm. We’ll also be retreating to our little Outpost (working on a fun name for the shed) on chilly, rainy days for lunch breaks. 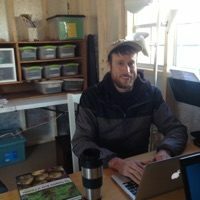 I am especially grateful to have a proper space for farm planning and record keeping. 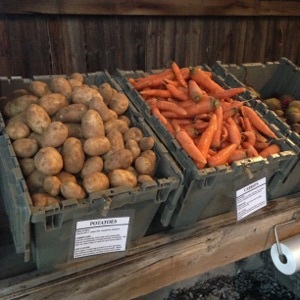 Carrots: We had our all-time greatest yield of 3,357 lbs, and we were able to distribute carrots every week from July 18th to the end of the season. 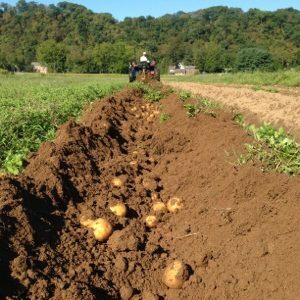 Potatoes: We also had our all-time greatest yield of 3,803 lbs. We began distributing them on July 15th and continued every week for the rest of the season except for one. 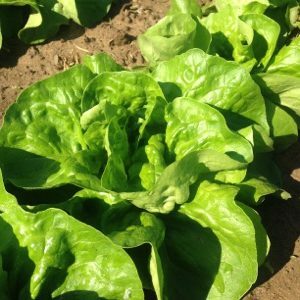 Lettuce: The 2017 lettuce reached an all-time greatest yield of 3,752 lbs. As in past years, we were able to distribute it all season with only a couple of exceptions. As a farmer, I was very satisfied with how well these crops performed. As your farmer, I was thrilled to be able to distribute these popular staple crops so consistently throughout the season. 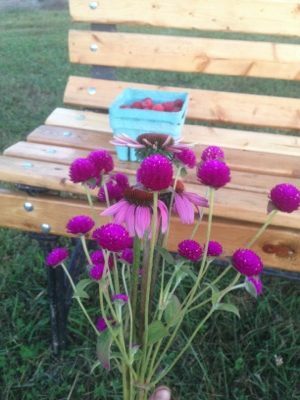 Echinacea: Last year, we expanded the pick-your-own flowers by adding an entire bed of echinacea, or purple coneflower. It has grown beautifully, and since it’s a perennial, it’s coming back this year. Bonus: you can pick the flowers and use them for an immune-boosting tea. Radicchio: This is the first season we’ll be including this colorful and tasty bitter green. It will make its appearance in a few Spring and Fall shares this year. I chose to grow radicchio because it’s a great veggie for grilling and can add a lot of flair to salads. Raspberries: Last year, we established 4 beds of raspberry canes. They weren’t supposed to fruit in their first year, but I was pleasantly surprised to see that they did fruit a little bit. I hope their precocious beginning foretells a productive 2018 season. I’m excited to open up the raspberries for pick-your-own this year. We are looking forward to sharing the 2018 harvests with all of you. I am continually impressed at how hundreds of tiny seedlings turn into hundreds of pounds of tasty produce. We are determined to steward these plants and this land to grow another season’s worth of healthy veggies for y’all. Sign up for 2018 here.